In order to imagine the future, we have to determine what one’s present needs! Brussels, being the constitutional capital of Belgium has been privileged along the centuries. It is not only the capital of its own country but also the capital of the whole European Union. It has aroused to host most of the EU activities and has succeeded to imprint its importance on the European map. All the buildings erected in Brussels for serving the EU agenda have been addressed to political and economical causes. Brussels has therefore divided itself into serving two categories: the Brussels local citizens and the EU “tie-wearing men”. Brussels has been serving its citizen with the best localized social activities without letting its EU prestigious position affect them. In other words, the EU agenda is gibing Brussels political, economical and defensive agenda more consideration than the “real” social aspect. And since nowadays the world calls for social interaction, either locally or international wise, we asked ourselves the following: How can the Brussels Courthouse with its pioneering position help to enhance the EU social factor where Brussels citizens could feel that they are “socially” part of the EU capital? The Brussels Courthouse is the perfect solution for the question written above. For Brussels, the courthouse is an iconic landmark according to size, location and importance (locally and to the European region). The building does not only embody the political and constitutional power, but also stands as an art object with its enriched ornaments. Today, the Brussels Courthouse faces big challenges as it has lost its pioneering function as the city’s courthouse. That’s why we believe the building should have a new function in order to save it from the functional deterioration it faces. The Courthouse not only towering above the lower part of the city but also standing in the EU capital shall be called: the EURO-NODE. The Building standing on a high point in Brussels facing the long spine of Rue de la Régence is welcoming the Brussels citizens inside to interact not only as Brussels’ local citizens but as the EU capital citizens. They are not only to gather among each other but among other people of the European Union. The Euro-Node shall stand as an “individual-interactive city” connecting the Brussels citizens vertically and the EU society horizontally. The Brussels Courthouse, namely the Euro-Node will be added as the 8th institution, of the 7 existing institutions of the European Union, hosting the social interactive agenda for the EU society. 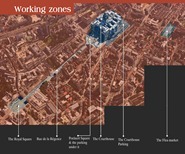 The Brussels Courthouse along with Rue de la Régence and Place Poelaert will help to enrich the project. Rue de la Régence will become a permanent pedestrian street accommodating all kinds of installation and activities in order to enhance the social interaction. On the Rue de la Régence a new pattern is designed according to the pattern drawing of the Hall of Lost Steps. This prolonged pattern operates as a pedestrian approach leading to the main entrance of the Euro-Node. Along this spine many activities can be presented: EU-parade, seating areas, commercial area, etc. At the end of Rue de la Régence, the Place Poelaert, the tramway is to be relocated elsewhere, in order to have a wide empty urban space where several events can take place. These events are not only for Brussels citizens but as an urban space neighboring the Euro-Node it can also host various activities concerning the EU society members. This urban space which is in front of the building’s main entrance is flexible to be designed according to its seasonal occasions. Next to the monument of the two world wars (on Place Poelaert) a stairway is located in order to take people to the underground museums. The world war monument is going to be a land mark for the entrance of the museum, showing how Europe evolved since these dark times to where it stands today. The existing underground parking is to be transformed and expanded into a museum of the EU history. The reason why we did this, is that we want to have an invisible intervention without affecting the courthouse architectural lines. A pathway (link) will be made leading to a part of the Brussels Courthouse underground level. This second museum will be about the Brussels Courthouse historical legacy. After finishing this tour where one get’s to see, know and interact with the past, the Euro-Node “citizens” then gather upstairs in the Hall of Lost Steps, the place where they begin their “interaction with the present towards the future”. While dealing with building itself, a problem occurred due to the various entrances of the building, thus it was hard to work with one entrance and neglect the others. So our proposal is the following: multi-entrances = multi-uses. level) one starts to get to know what the main function of the Euro-Node is: an educational and cultural centre with its exhibit zones. Each country of the EU is to single out with all its authentic cultural and educational features and it will have the opportunity to present it in its own way. Each EU country is free to choose the kind of specialties it wants to offer inside the Euro-Node, where people can be interested in getting to know (for example: language, music, art, theatre…etc). 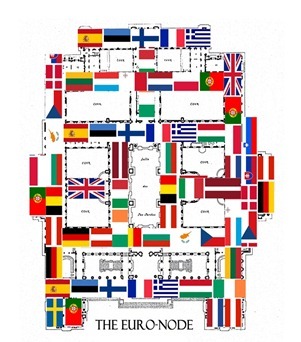 According to the building’s top view drawings the smaller rooms arrayed in the Brussels Courthouse building’s border will be divided according to the activities each country presents (seminars, workshops…etc). These smaller rooms are ready to be re-divided in case of any futuristic addition to the EU countries. The 27 courtrooms inside the Brussels Courthouse building will belong to the Euro-Node presentation rooms. In each courtroom various group activities can be performed (Recital, lecture, seminar, workshop …etc). As the judge is seating as a symbol of law & Safety in the courtroom when it was a courthouse , in the EURO-NODE instead of the judge there is a famous presenter , a great lecturer , etc, as a symbol of knowledge and culture mixer, which Brussels should be responsible for it by its EURONODE. The important characteristic about the Euro-Node is that each EU country will not only perform its traits individually. The Euro-Node gives the chance of an EU interaction, meaning that two or more EU countries inside the Euro-Node can gather and perform interactional “joint venture”. These interactions are to be performed inside the middle zone of the building. 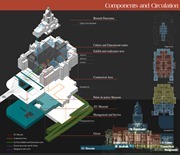 All the activities which are planned and organized inside the smaller rooms of the building’s border, they are to be performed and presented in the building’s core or the Place Poelaert or even Rue de la Régence. Entering the Euro-Node from the Place Poelaert one will be walking around the building, meditating the great historical architectural masterpiece with its rich aesthetic ornaments, as well as enjoying the various changing galleries produced by the Euro-Node “citizens”. The Euro-Node gives a new meaning of “a public zone”. In the 8 open courts of the building people either Brussels citizens or EU members or even tourists could interact with each. The 8 open courts are not to be defined by any of the EU countries. Each court will randomly host different functions (exhibit area, interaction zone… etc), thus no court is to be highlighted in comparison to the others.These open courts will be temporarily covered by provisional installations in order to take a shape of a covered pathway. And it will accessible from the hall of lost steps, and will permit light to enter to the commercial and museum level through transparent spots. Going up the building and reaching the dome level, one can start the tour of the Panoramic Brussels. Walking around the dome level which is the highest point of the building which is already standing on Brussels highest level, a perfect panoramic sight of the city is viewed. Stepping inside the Euro-Node from the side entrance, a commercial zone is to be found. On this level, cultural items from the various EU countries are sold or rented (reading items, audio-visual items, souvenirs … etc). This commercial zone will help develop the Euro-Node economic status. The parking located around the building and under the Place Poelaert is to be relocated to the site of the flea market, 250m away from the Euro-Node. 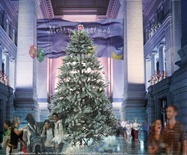 Accordingly, all the removed parking space will be altered with green area, to tempt the gathering of people around it. The green area can be functionally connected with the commercial zone, where people can for example grab a book from the Euro-Node book store and go out enjoy reading it in the outdoor area. The Euro-Node is in Brussels, but does not only serve the Brussels citizens to communicate with the various EU activities. It also gives the chance to host cultural and educational exchange where Brussels citizens could interact with other people from the different EU countries. Moreover, the Euro-Node as “a representative EU city” can perform other interactive workshops with other countries around the world. Thus, the Euro-Node building shapes a social sphere of interaction from the inside and outside. The Brussels Courthouse as a symbol of power and justice, standing on the ground of the EU capital, is to gather the EU countries amongst each other, creating the social sphere of the Euro-Node. In the Euro-Node, one no more belongs to a certain EU country: Everyone is an EU citizen. In the Euro-Node, this society is not politically united, but is empowered by their social interconnectivity within this building which shall always maintain its powerful and influential prominence. The Brussels Courthouse will be considered as a role “model” to the whole world. Through the Euro-Node countries all over the world will be more aware of the importance of countries’ cultural and educational interaction. This communication nowadays is of crucial importance in order to break the ignorance wall and build instead bridges for a better civilized peaceful and interactive world.